ISO refers to how sensitive your camera’s sensor is to light. Therefore, it affects the exposure of the image – that is, how much light is captured by the sensor. You can adjust your camera’s ISO setting to make the sensor more or less sensitive to light, depending on the situation. ISO is measured along a scale – usually from 100 up to 1600 – or even higher on some cameras. Each value on the scale is double the previous value. Here’s a common range: 100, 200, 400, 800, 1600, 3200, 6400. An ISO value of 200 makes the camera’s sensor twice as sensitive to light as ISO 100. ISO 800 is half as sensitive to light as ISO 1600. A low ISO value (e.g. 100 or 200) means low sensitivity to light. This is exactly what’s needed in bright conditions in order to avoid overly-exposed photos. A high ISO value (e.g. 800, 1600 or higher) means a high sensitivity to light. This helps in low-light situations where you need the camera to capture more light for a better-exposed image. This is particularly true when other ways of capturing more light aren’t available to you – such as a larger aperture size, or a slower shutter speed. ISO is one of the three fundamental elements which form part of the exposure triangle and control exposure on a digital camera. The other two are Aperture and Shutter Speed. In Automatic or Scene modes, and when you select Auto ISO, the camera will automatically set the ISO value to what it calculates is suitable for the situation. In the Semi-Automatic modes (Program Mode, Aperture Priority Mode and Shutter Priority Mode) you change the ISO values or, if your camera allows, select the Auto ISO option. How you change the ISO value will vary depending on your camera model. Many advanced cameras offer a dedicated dial which provides instant access to change the value. The photo below shows a dedicated dial on a mirrorless camera. The value is set to 400. You can also see the green AUTO setting. Some cameras have an ISO button which needs to be pressed before you can change its value. The photo below shows the button and value (ISO 160) on my Canon 5D mk ii. The LCD screen will then show the current ISO value which can be changed either using one of the control wheels on the camera body or, with touch screen models, by tapping the + or – symbols on the screen. When you take a picture, light from the scene enters the camera and hits the sensor, creating a digital image. Exposure refers to how bright or dark the resulting photo is. Achieving a good exposure is essential for creating high quality, visually appealing photos. When taking a photo your aim should always be to achieve the best exposure possible, so your photo doesn’t appear too light or too dark. If a photo is under-exposed (too dark), detail will be lost in the shadows (darker areas of the image). When a photo is over-exposed (too bright), detail will be lost in the highlights (brighter areas of the image). The key to creating perfectly exposed images is to balance the ISO, aperture and shutter speed values to ensure the image doesn’t appear too dark or too bright. 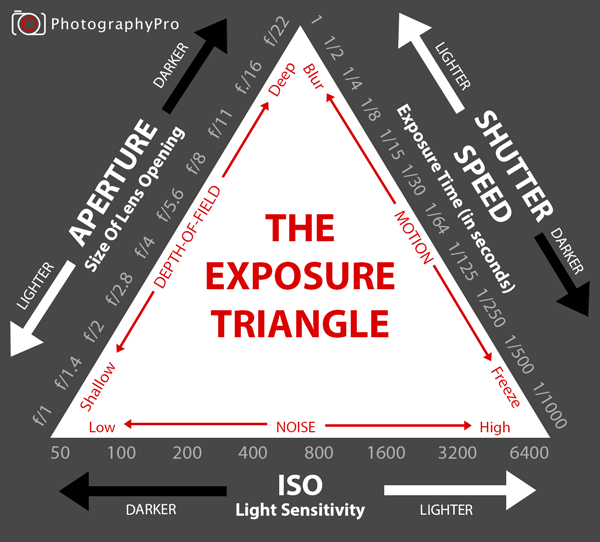 The exposure triangle diagram below illustrates the relationship between these three elements. It helps you understand why your camera automatically chooses certain exposure values and what you can do to take control of exposure when you need to. When you have enough light for a good exposure with your chosen aperture and/or shutter speed – you should choose the lowest ISO value. This makes the camera’s sensor the least sensitive to light it can be. The benefit of this is the lack of grain or noise in the final image. When there is insufficient light for a good exposure, and leaving the shutter open longer, or increasing the aperture size isn’t an option, you should choose a higher ISO value. The downside of this is the introduction of grain or noise, as described later in this article. When you want to use a faster shutter speed – to freeze some action – but the light conditions mean your camera is limiting you to a relatively slow shutter speed, you can “unlock” the faster shutter speeds by increasing the ISO value. When you want to use a smaller aperture – perhaps to get a greater depth of field – but the light conditions mean your camera is limiting you to a relatively large aperture size, you can “unlock” the smaller aperture by increasing the ISO value. This is because of the Exposure Triangle which insists on a balanced exposure. As you increase the ISO value, either the shutter speed value has to increase (to let less light reach the sensor) or the aperture size has to decrease (again, to let less light reach the sensor). When you increase the ISO value by one step (e.g. 100 to 200, or 800 to 1600) you make the camera’s sensor twice as sensitive to light. To keep the exposure balanced the camera needs to halve the amount of light reaching the sensor. It does this by increasing the shutter speed by one stop (e.g. increasing from 1/400 to 1/800), or decreasing the aperture size by one f-stop (e.g. changing from f/8 to f/11). If you are shooting in Manual mode, you’ll need to make these changes yourself. When you decrease the ISO value by one step (e.g. 200 to 100, or 1600 to 800) you make the camera’s sensor half as sensitive to light. To keep the exposure balanced the camera has to double the amount of light reaching the sensor. To do this, it either decreases the shutter speed by one stop, or increases the aperture size by one f-stop. Again, if you are shooting in Manual mode, you’ll need to make these changes yourself. Some photographers love their images to be grainy – particularly with black & white photography – but unless you are using “noise” deliberately, it’s usually considered to be undesirable. Noise appears in images as random colored pixels, especially in darker areas of an image such as night skies. This is caused by random fluctuations in electrical signals passing through the sensor. This makes some of the sensor’s pixels a little lighter or darker than they should be. This happens whether there is a lot of available light or a little, but it’s mainly a problem in low light. When a lot of light is available these random fluctuations are overpowered by the available light. The “noise” is too weak compared to light being captured, therefore the noise isn’t as noticeable. In low light situations, where the ISO setting has been increased, the captured light energy is similar in electrical terms to the fluctuating electrical signals already present on the sensor. The camera then amplifies the brightness of all pixels – including those which have been randomly affected by electrical signals. This is why the grain or noise becomes so noticeable. Imagine your camera’s sensor is a room full of people in which the all the sound is being recorded. Many of the people are chatting very quietly. This is our random “noise”. Light is represented by our guest speaker talking without a microphone. If he talks too quietly for us to hear him (too little light) then we need to amplify the recording (use a higher ISO value). When we do this, we also amplify the other people in the room who are chatting – and the result is a “noisy” mess. If our guest speaker speaks loudly and clearly (a lot of light) then we don’t need to amplify the recording (we can use a low ISO value). The difference in volume between the speaker and the people chatting is large, so the “noise” is too quiet to be noticeable. ISO is the sensitivity of your camera’s sensor. You can vary the ISO whenever you want, inbetween every shot if you like! Your camera will automatically select a suitable ISO value in Auto modes. Most modern DSLR and Mirrorless cameras have an “Auto ISO” setting which tells the camera to choose a suitable value. In semi-automatic modes and manual mode you can take control of the ISO yourself. Sometimes you can’t, or don’t want to, increase your camera’s aperture size or use a slower shutter speed. In these situations, increase your ISO value until you get the correct exposure. By now you should be comfortable to take control of ISO when you need to. As always, don’t be afraid to experiment.